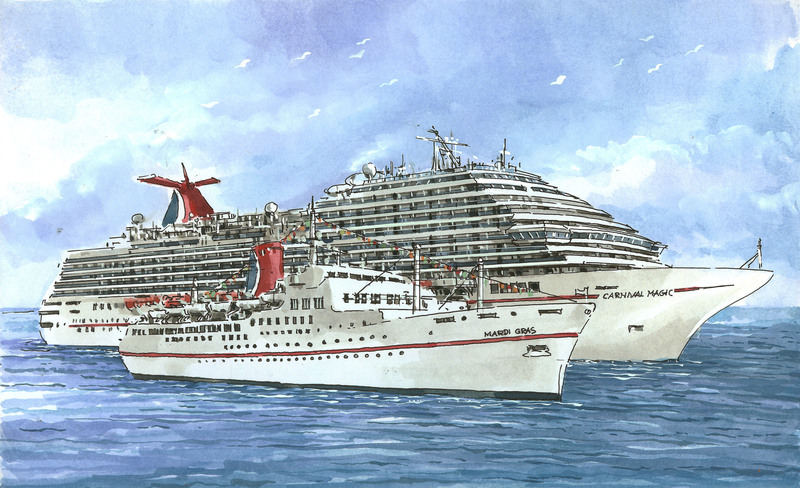 In an artist rendering commissioned by Carnival Corporation & plc to commemorate the launch of its 100th cruise ship, the Carnival Magic, delivered earlier this week, is depicted sailing with the company’s first ship, the TSS Mardi Gras, which began service in 1972. 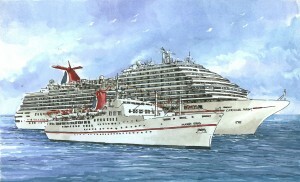 At 130,000 gross tons, the Carnival Magic is almost five times the size of the Mardi Gras’ 27,250 tons. Carnival Magic stretches 1,004 feet in length with a beam of 158 feet and a capacity of 3,690 guests compared to the Mardi Gras’ 650-foot length and 86.5-foot beam and passenger capacity of 906.